CRIMSON binary installers are provided free of charge. The Trial Version is time-limited to 90 days per release, but downloading a newer version will reset the clock. ​We do this to encourage people to use the latest release. Due to licencing, the current mesh generation software in CRIMSON, MeshSim by Simmetrix Inc., will soon be removed from the Trial Version. Before that occurs, a new release of CRIMSON, incorporating the TetGen mesher will be made. 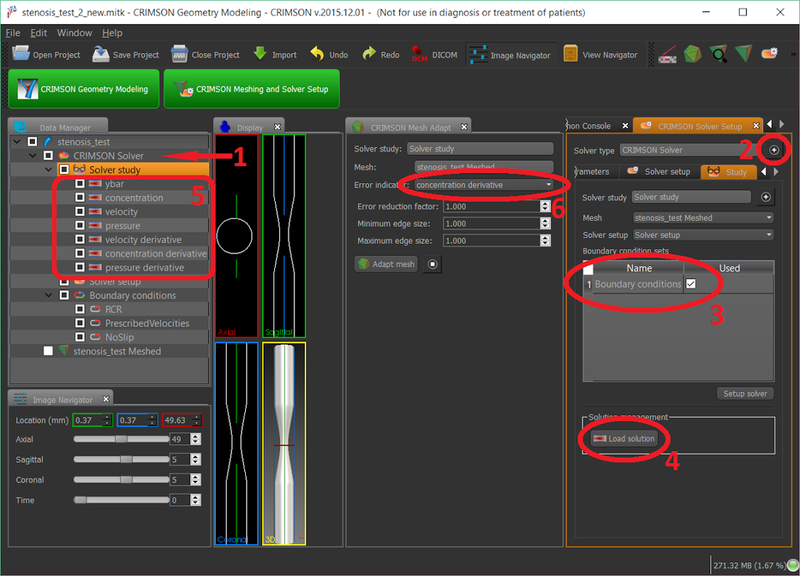 You are advised to ensure your models work with CRIMSON+TetGen before CRIMSON+MeshSim is no longer available. We are working to find ways to make CRIMSON+MeshSim available again in the near future. New PC-MRI module for processing patient specific velocity profiles from PC-MRI images. This enables users to impose the true aortic inflow profiles on their models. Please cite our upcoming article if you use this tool: Optimal B-spline Mapping of Flow Imaging Data for Imposing Patient-specific Velocity Profiles in Computational Hemodynamics, A. Gomez et al. IEEE TBME. Integration with MITK 2016.11 and updates to ITK, VTK and some other external libraries. VMTK scripting in Python is now available in the CRIMSON Python Console. A brief introduction is provided below. 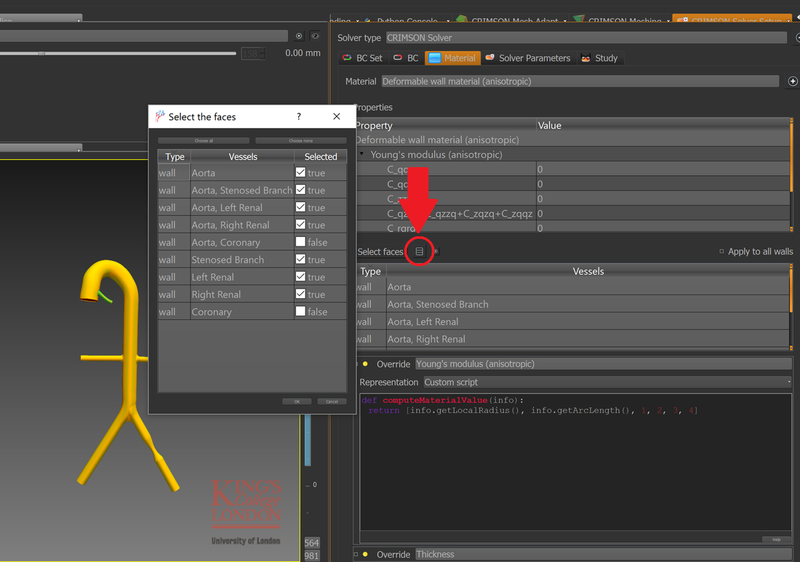 Start by importing a .vtk file representing a vessel surface object into CRIMSON. Open the CRIMSON Python Console. Drag and drop the vessel surface object (1. in the image below) from the Data Manager window into Python Console Variable Stack (2. in the image below) in order to make the object accessible through Python interpreter. ​Note that wall_Right_Renal is the name of the vessel object which was imported from a .vtk file. Adjust it to match the name of the object for your specific case! ​The code will make an additional window pop-up, which is used for VMTK interaction. 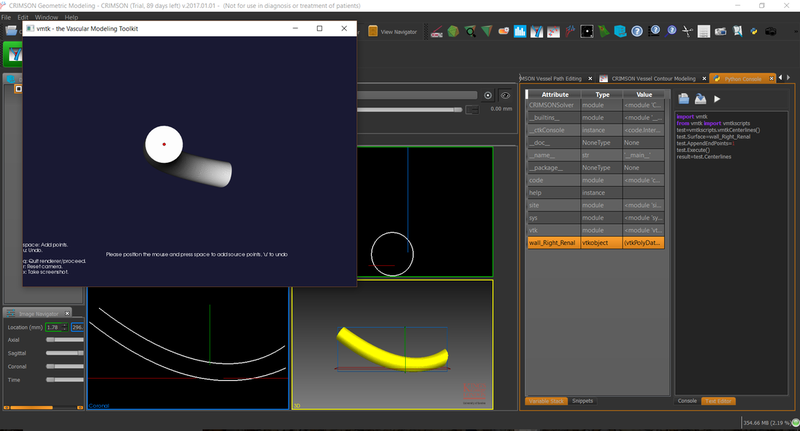 The window will prompt the user to select 2 seed points on the rendered vessel object. Proceed as instructed by the window in order to place the seed points. ​The calculated centerlines are stored in the Python Console Variable Stack as a variable named result. 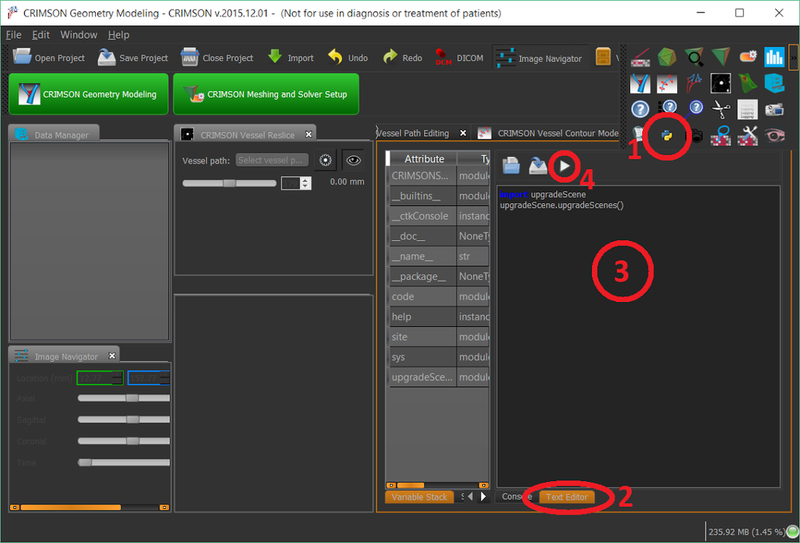 In order to move the variable into the main CRIMSON Data Manager simply double click on result (marked in the image below). The centerlines will be automatically rendered in the CRIMSON rendering windows. Fixed a file extension bug which caused saved netlist files to have the extension ".xml)" rather than ".xml". Make sure to remove meshes you don't use - they use up a lot of memory! The solver setup is now done using the python scripts to allow extensions to be built by the users without need for recompiling CRIMSON itself. The scene format was changed to adopt these modifications and therefore, the old scenes need to be upgraded to be loaded in the new version. Upgrading may take some time especially for large scenes. However, this only needs to be done once per scene and it will produce the "filename_new.mitk", which you can then load. The scene size will also increase, but you can fix this by loading the scene and save it to a different file using "Save as...". All the contents of the scene will be preserved, except for the adaptation parameters. 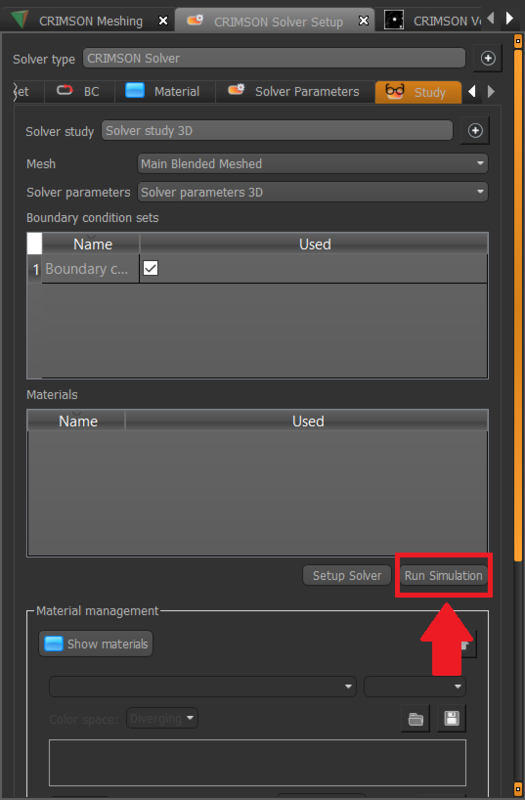 The overall solver setup workflow has also changed. ​The documentation for the Python interface can be found here. The Python code for CRIMSON Solver is located in "CRIMSON install dir"\bin\Python\lib\site-packages (similar location for Linux). If you want to add your own complete solver setup package, add the directory containing that package in Window -> Preferences -> Python solver setup. Export/import vessel paths with contours for matlab data exchange. Access this functionality through context menu of the vessel tree in data manager. Added reparenting action for vessel trees and vessel paths. Note that the derived data such as lofts, blends and meshes will not be preserved, but can be restored by re-lofting/blending/meshing. 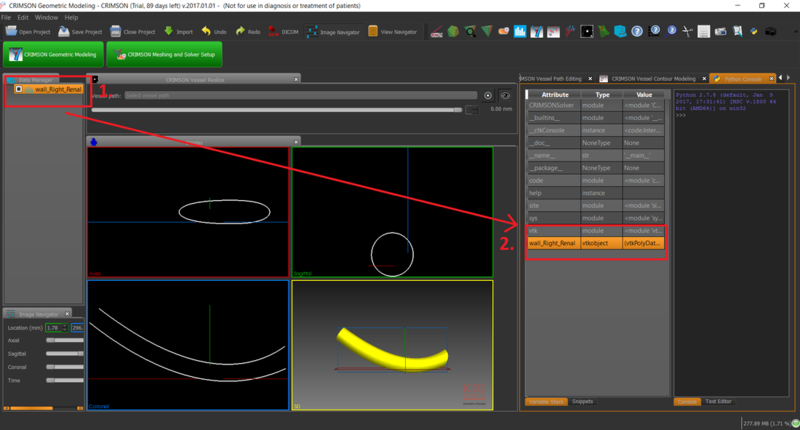 Show/hide contours context menu items added. 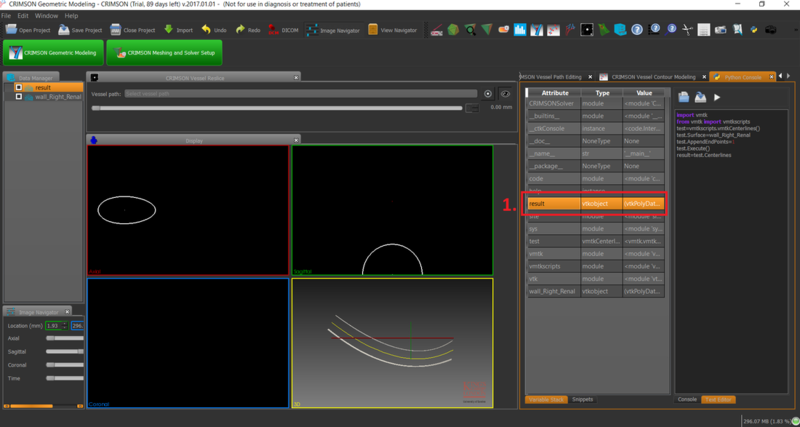 Error message for blending shows the contours/vertices where the error occurred if possible. Fixed problems for imported models failing to mesh after save/load project. Meshing view always shows all faces, but a new column is added that shows whether local parameters are modified for this face. Fixed performance and memory issues for segmented contours. First release based on MITK 2014.10, Qt5 and OpenCASCADE 6.8.0.